If there was a Laverne & Shirley, a Mary & Rhoda or even a Tina Fey & Amy Poehler of the WWE, it would be Peyton Royce and Billie Kay. Known together in the ring as the villainous duo The IIconics (yes, with two I’s), Royce and Kay have been attached at the hip even before arriving from Australia to WWE’s developmental brand NXT. Now on the main roster of SmackDown Live, the pair has picked up steam entertaining the masses in front of a bigger audiences. The successful Aussies return home Down Under to face Naomi and Asuka before a WrestleMania-sized crowd in Melbourne at Super Show-Down October 6, broadcasting live in the States at 5/4c in the morning on Pay-Per-View and WWE Network. It's a dream come true for the superstars. 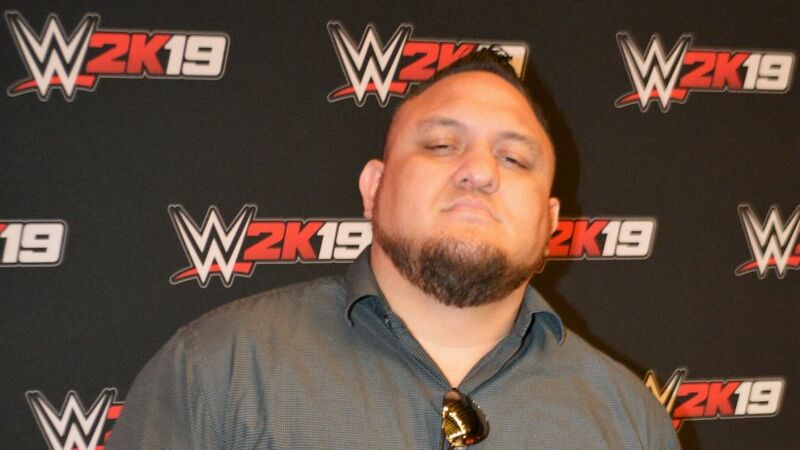 Another came after getting a glimpse of themselves in the upcoming WWE 2K19 video game. Needless to say, they were impressed with their respective likenesses and took time after to talk about this and more in an interview with TV Insider. Was this the first time you two have seen yourselves in the video game? Peyton Royce: That was the first time. What does it mean that this moment is happening at the WWE Performance Center. Billie Kay: We started here. We had our first day here and three-and-a-half years later we get to see ourselves as the IIconics in 2K19. It’s so surreal. And this comes just months after the IIconics made their main roster debut on SmackDown Live. It was a night we asked the former Emma about not long ago. She mentioned how proud she was of you two. Kay: That means a lot. She paved a lot of the way for Australians and for women’s wrestling. We just hope we are making her and the women before us proud. We just hope we’re able to pave more of the way behind us who are coming in after us. Royce: We love that we’re Australian. We love the country that we are from. We just hope we are doing them proud and inspiring everybody back home. We're sure the fact that you are reaching these milestones together makes it that much more special. How has the fact knowing you can depend on one another on the road eased your transition from NXT to WWE? Royce: I would have been the exact same way. Royce: We feel complete. We really do. I feel like myself when I’m with Billie. She brings out the best in me and vice versa. How far back does this bond go? Royce: We actually went to high school together. We didn’t like each other. We had an unspoken rivalry of who was the biggest wrestling fan in the school. Kay: As soon as we spoke and had our first training session together, we were instantly best friends. We’ve known each other for 10 years now, so we’ve done a lot of growing up together. We’ve had the same goals forever. We’ve been going in the same direction, pushing each other and being there for each other along this time. One of the things that we’ve noticed about the IIconics is standout facial expressions and body language. There is a sense of improv or what you are doing feels natural. Where does this timing and inspiration come from? Kay: It’s all 100-percent real, hands-down. Every reaction, emotion and facial you see we do in day-to-day life. That’s where we pull our inspiration from our real life and our real-life interaction. I love that we can say that. Of course, we get inspired by pop culture. Royce: Billie is a huge movie buff, and we both love reality TV. Kay: We love Total Divas and Total Bellas. Miz & Mrs. has been amazing. But we are big Jersey Shore fans. Anything competition based. I just finished watching World of Dance last night. Unhappy with the result, but still love the show. My point to all of this is our favorite characters we see on TV, we are influenced by them. I feel like things come out naturally. She’ll say something, and I’ll laugh like Chandler from Friends. It’s natural. When we have off days, and we don’t get many, we always spend them together. She is the only person I can do that with. We got to the movies. We have game nights. We go out to dinner. We go shopping. Just girly things. Royce: Classic best friend stuff that you do. Sometimes I’ll just hang out at her place with the dogs. Kay: Like I knew we were seeing each other today, but we were texting al morning. We couldn’t wait. I think it’s more we just like being around each other. We don’t like when we’re apart. There is lots going on in WWE right now with the Mae Young Classic, the Superstar Show-Down and then the first all-women’s Pay-Per-View Evolution. If you had your way, who would you face on that show? Royce: I’m just going to speak on behalf of Billie here too, but it would be a three-way tag team match with the IIconics versus LayCool versus the Bella Twins. Kay: I’m going to add another team in there. Royce: I already know what you’re going to say but go ahead. Kay: I was going to say Natalya and Beth Phoenix. Would you ever want to see a women’s tag team titles? Kay: One hundred percent yes. Royce: That has been our dream even before we got to the Performance Center. Kay: We have always spoken, and quite publicly, that we want to pioneer that. We want to be part of this era of the women’s tag team division. Royce: We want to have a part of it when it does happen. I feel it will happen in time, so we want to have a positive influence on that. Now that your platform is bigger with more fans and presence on social media, you also open yourself up to more detractors on social media. There is this double-edged sword, so talk about how you’re managing it all as public figures. Royce: You know, if it wasn’t for Billie, I would really struggle. I’m just being completely vulnerable here. You’re right. Being on the main roster, there is a lot more talk. Sometimes I can’t even go on Twitter for days because I just feel it's negative comment after negative comment. I understand that I put myself out there, and everyone is allowed to have their own opinion and say what they want, but Billie reminds me I have to take a step back. It’s just social media. This is the highlight reel of my life. Kay: Sometimes I go into mom mode. Being a little bit older, I get more protective of Peyton. I feel like I always have to watch out for that because we do have thick skin. Being in this business you have to have thick skin. But in saying that, you do get a lot of negativity. That’s just how it’s going to be. Everyone has their own opinions, and I’m not going to let someone else’s opinion affect my life or feelings because I’m in control of that. We always try to bring each other up. That’s what is important in life. Royce: There is the negative aspect of social media, but there is a lot of positivity that comes from it too. Like my favorite thing in the world is seeing someone wearing our Iiconics shirt. Billie and I try to highlight that on our Instagram story. That makes me genuinely smile. That makes me so happy to see. Kay: Because we appreciate our fans so much. They are the best part of our careers. Royce: We wouldn’t be us if we didn’t have our fans and them supporting us too. I think that is a good way of looking at it. We have so much positivity, and that definitely outweighs the negativity. And then there are really good times on social media when you get a tweet from The Rock. Royce: Oh, my goodness. That was years ago, and we are still talking about it. Kay: I’m still talking about it. We are best friends though because he tweeted that emoji to me. So, I’m pretty sure we are friends. Royce: Oh, is that what that means?